Over 50 former Twiggs County students had the chance to graduate high school. Some have waited for this opportunity for twenty years. Governor Nathan Deal recently signed House Bill 91, which got rid of the High School Graduation test. Now, 9,000 students all over the state who may have failed part of that test can get their diplomas. State Representative Bubber Epps attended the Twiggs County ceremony. He says he is glad students will be measured by their work as a whole, rather than one test. "Not completing that test or being successful on that test was a hindrance to them moving forward without a diploma," Epps explains. "This is now removed, and they can take every advantage in the employment field, educational field, or whatever their desires are." 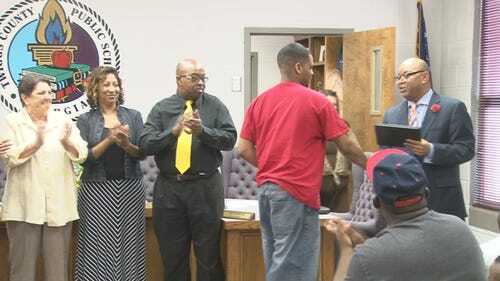 Phyllis Bernie was applauded as she shook Superintendent Elgin Dixon's hand. She completed high school in 1997, but she did not receive documentation until Tuesday night. "I was just really happy and excited," she says. "Now, I can get the job I want." With her diploma, Bernie says she wants to go to nursing school. "I think it's going to do a great measure of improving the educational structure of our state," Epps says. Dixon encourages all of the graduates to pursue a new career or higher education. "This should be an open door of opportunity," concludes Dixon.